It really hurts for me to write this. I’ve liked Mark Levin from the moment he went on the air, for he is just about the only talk radio host who notices the danger from Communist China. However, I have to respond to the erroneous (and I’m being generous) attack Levin launched against John McCain in his spin-laden endorsement of Mitt Romney in National Review. Even worse than denying his own record, McCain is flatly lying about Romney’s position on Iraq. As has been discussed for nearly a week now, Romney did not support a specific date to withdraw our forces from Iraq. The evidence is irrefutable. And it’s also irrefutable that McCain is abusing the English language (Romney’s statements) the way Bill Clinton did in front of a grand jury. The problem is that once called on it by everyone from the New York Times to me, he obstinately refuses to admit the truth. So, last night, he lied about it again. This isn’t open to interpretation. But it does give us a window into who he is. Out of the eight sentences written there, seven are incorrect. If you want the details, look here. John Williamson, federal director of the Canadian Taxpayers Federation, looks into the surprising costs to taxpayers of abortion in "A not-so-private matter of abortion." Who do you think would make the best U.S. president from Canada's point of view? That's the question the Canadian Centre for Policy Studies is asking on its online poll. So far, Barack Obama and Mitt Romney are neck and neck. In a recent Canwest news article I was quoted as saying Prime Minister Stephen Harper's decision to no longer seek clemency for Canadian citizens on death row in the United States was good politics. It was good politics, I argued, because "law and order" issues play well to Harper's base. I remember the reporter who interviewed me was skeptical about this because, after all, Canada is such a liberal country. Well lo and behold a recent poll shows that 53 percent of Canadians support the government's position on this. What's more, support for revoking clemency is highest in British Columbia (61 per cent) and Alberta (58 per cent) which just happen to be the two provinces where a large chunk of the Conservative base resides. So maybe the lesson from all this is that Harper should play to his base a little more. What I find especially interesting in this Washington Post story, about concerns over the conservative bona fides of John McCain, is the matter-of-fact, fourth-paragraph reference to McCain's having conducted a conference call with bloggers. A politician treating bloggers like real journalists. What's the world coming to? Ori Rubin gives us the first feature installment of a special three-part series on the Canadian Human Rights Commissions entitled "The HRC on Trial." 1) How many Americans realize "timetables" was indeed the buzzword for withdrawal when Romney used it back in April? 2) How is it that no one took the time to crticize Arnold Schwarzenegger's idiotic "global warming" plans? 3) Will anyone really remember this amidst McCain's parade of endorsements and tomorrow's Dem debate? Unless the answers are (1) few, (2) no one cares, and (3) yes, I don't see anything stopping McCain from winning the GOP nomination. The again, I would say that. Listening to the Republican debate, I can't help but think that the Reagan worship has gotten wildly out of control. I mean, really, folks - he was a great man and one of the greatest Presidents but, the way that people are talking about him these days, I'm starting to think that we should forget about building a Reagan Memorial in Washington and instead just get it over with and build a temple to worship the man. The Western Standard hosts regular seminars about investment opportunities presented by our advertising partners. Here’s one on investing in farmland being presented by Amcapita Investments. I think you’ll enjoy their presentation in Calgary and their research report on the macro-economic trends driving the agriculture boom. Amcapita Investments has created Canada’s first RRSP-eligible farmland investment partner – and they are big supporters of the Western Standard. If you live in Northern Alberta, you may want to attend the North of 60 Resource Conference. With gold reaching new highs everyday, many investors have turned their attention to mining stocks. The Western Standard is a proud sponsor of the North of 60 Resource Conference each year. Canada’s North is becoming a resource hotspot with many exciting projects and investment opportunities in the junior mining sector. Don’t miss this resource show in Edmonton on February 12th. Here are the details. The Western Standard events page will be up shortly and I'll post this information there in the future. What do you call the firing of five senior government bureaucrats? • Linda Keen, President of the Canadian Nuclear Safety Commission, fired in the “dark of night” for embarrassing the government by exercising her mandate to enforce nuclear safety regulations. • Adrian Measner, President and CEO of the Canadian Wheat Board, fired for his decision to follow the direction of the CWB’s farmer-elected Board of Directors. • Johanne Gélinas, Environment Commissioner, fired after publicly commenting to the media about her not receiving sufficient information from the government about its "Made in Canada" environmental plan. • Yves Le Bouthillier, President of the Law Commission of Canada, fired after all federal government funding for the Commission was eliminated. • Allan Amey, President of the Canada Emission Reduction Incentives Agency, created to oversee federal compliance with the Kyoto Protocol, fired in 2006 and the agency dismantled. They took a more cynical view of this “dangerous trend” than I did. Let's hope the job vacancies go unfilled for a while. Capitalism might just break out. Are health care premiums a “good” tax? The Canadian Taxpayers Federation (CTF) will be delivering 2,000 more petitions to Premier Ed Stelmach tomorrow calling on the Alberta government to eliminate health care premiums. This brings their petition count to 11,000 names. According to the CTF, Alberta's health care premiums cost the average family $1,056 per year and bring in $979-million in tax revenues. The 64,000 member strong, tax-fighting advocacy group thinks the Alberta government doesn’t need any more money and that eliminating health care premiums will help average families in need of tax relief. It’s a nice thought, but I’m not sure scrapping health care premiums is a good idea. Health care isn’t free – and health care premiums are a good reminder of this. In fact, maybe these premiums should go up to reflect the rising cost of health care. Instead of scrapping health care premiums, why not scrap public health care and invite Albertans to direct those same premiums toward private insurance? If that’s too radical a proposal, just cut general revenue and leave this user fee in place until Albertans are ready for a real free market solution. Tell me why I’m wrong, Scott. Love thy neighbour! And that's an order!! "The legal provision should keep before our eyes the general risks of debasing public controversy by thoughtless and, even if unintentionally, cruel styles of speaking and acting," he said to the Times. I guess this would mean that rabble-rousing iconoclasts, preaching revolutionary theological concepts that scandalize the establishment, would be breaking the law. Or does the archbishop have a loophole in mind that would allow a modern-day Jesus to escape the net of his censorious law? "Forget the free lunch--employees can't even have free coffee without noting it on their income taxes." "As the Conservative Party is learning, buying votes by lavishly doling out grants is not as easy as it used to be." I'm guessing that nearly every American source of news trusted by the Canadian readership (NR, Fox News, talk radio, most bloggers, etc. ), will insist that McCain sandbagged Romney by claiming he (Romney) once supported a timetable for withdrawal from Iraq. For why this quote is so damaging (and why McCain is right to point it out) read on. Full disclosure: I've been a McCain supporter since Sunday. Alexander Cockburn might, under ordinary circumstances, be the sort of crypto-communist who I'd like to have exiled to an Alaskan work-camp but even a stopped clock can be right once a day. Cockburn joins the long list of people who've said perfectly sensible things about the hysteria over Climate Change and resultantly been subjected to a level of abuse ordinarily encountered only by someone wearing a yarmulke in Mecca. Here in the West, the so-called ‘war on global warming’ is reminiscent of medieval madness. You can now buy Indulgences to offset your carbon guilt. If you fly, you give an extra 10 quid to British Airways; BA hands it on to some non-profit carbon-offsetting company which sticks the money in its pocket and goes off for lunch. This kind of behaviour is demented. Of course, other people have said this all the time - but it's refreshing to hear an out-and-out red say it. At least the whole world hasn't gone crazy. Since I started writing essays challenging the global warming consensus, and seeking to put forward critical alternative arguments, I have felt almost witch-hunted. There has been an hysterical reaction. One individual, who was once on the board of the Sierra Club, has suggested I should be criminally prosecuted. Indeed, if he could step back a step further, he might observe that this sort of derangement is a central part of the modern left. Indeed, that the basic character of a good portion of his side is totalitarian at heart. Just for the record - and in the interest of averting comments about my first comment in relation to my remarks about the left, my opening remark was a joke. Cockburn's niece is way to hot for me to wish him any specific harm. Chapters-Indigo's site is down at the moment, but - as of a few hours ago - Jonah Goldberg's new book, Liberal Fascism, has finally hit Canadian shelves. There were five copies listed as in-stock at the Coles store at Lougheed Mall in Coquitlam, BC. I'm guessing that stock at the rest will arrive and be set up tomorrow or the day after, since books tend to arrive company-wide when ordered. Perhaps someone might ask our nation's monopoly bookseller why it took the better part of a month for them to get a New York Times-bestselling book onto their shelves. They don't seem to have any trouble stocking the other side's books. But, as I recall, they did have some difficulties with Mark Steyn's last opus. For that matter, they had their issues with the print version of this magazine. Now, I'm a long-time Chapters customer (well, I'd pretty much have to be, wouldn't I?) - but I don't think that it can be denied that there's always a certian liberal bias in which books they stock, which they discount, and which they display. As a private business, of course, that's their right. However, one has to wonder if such behaviour is appropriate for a company which holds an effective monopoly on book retailing in this country (at least, a bookstore monopoly). I'm not free to just go to the local Barnes and Noble, after all (though, it should be said, that the Barnes and Noble in Bellingham didn't have it in stock last night either - said they were sold out - and that the girl at the counter gave me a real look when I asked after it). One of the downsides of made-in-China stuff is that, while it might be cheap, it's still junk. It's just that, ten years ago, in general you only got junk if you were buying the same. b) An adapter plug to use a conventional headset with my iPhone. c) A Logitech wireless mouse. None of these items were cheap off-brand knock-offs. They were all either relatively high-end products or accessories. None of them was much more than a year old (the router, I believe, was the oldest item at thirteen months). The interesting thing is that, for the most part, I replaced these with more or less identical items. Indeed - I drove literally minutes ahead of the snowstorm which blanketed the Lower Mainland in order to replace my iPhone headset at the AT&T store in Bellingham, WA (yes, I realize that this is probably further evidence that I'm deranged, but I'm cool with that). The mouse, I bought another Logitech mouse - but actually went up to one of their VX Revolution models. But, for the most part, that was because of a lack of a reasonable alternative. My point isn't just to whine - it's that there's a market opening here. If someone were to manufacture products of a deliberately superior quality - and to advertise touting their relaibility at fairly reasonable prices - I would pay a premium. Indeed, I'm in the market to consolidate my mess of computers (three in use at present) into a single unit, for reasons of portability. I'm looking at either getting one of the current-generation MacBook Pro's refurbished from Apple, or waiting for the Penryn-based Pro's to ship. But, frankly, as an avid reader of Apple forums, I'm a little concerned about the generation-after-generation reliability problems that we've seen in the Pro's (everything in the first gen, and all sorts of LED-related fun in the present gen). The result is that I'm thinking of a T62 ThinkPad as an alternative which, despite also being Chinese-made, seems to have a much better track record so far as reliability is concerned. Though, I don't think that will happen - since I'm kind of in love with the MacBook Pro. More than kind-of, actually. I want a brand-new one as badly as... Well, I'll just leave it at that. Of course, the biggest part of the manufacturing problem is that the Chinese are able to work unbelievably cheaply becuase they've replicated in an economic sense their traditional approach to warfare - the human wave. When you have a lot of people and don't care too much about their living conditions (don't have to care, for that matter) you can simply throw people into producing notebook computers - or at machine gun nests - and eventually numbers will tell, unless technology offsets mass. And there's where the West's real chance lies. Human waves aren't terribly effective against people with fully automatic weapons. "For we have got the Maxim gun, and they have not," said the British a century ago. That's the real secret to beating back the Chinese economic threat - we need the economic equivilant of a Maxim gun. As we say often down here, a week is a lifetime in politics. McCain won Florida. It looks like he's going to win bigger than indicated by polling. Seven or eight points is my guess. Now comes word that Giuliani will endorse him tomorrow in California. John McCain is, without a miracle for Romney on a bigger scale than McCain's own comeback (and in a single week) going to be the Republican nominee for President of the United States and, given how well he polls - and how ugly the Democratic race is getting - I'd say that McCain is now the odds-on favourite to be the 44th President of the United States. Ron Gray, national leader of the Christian Heritage Party, has just issued a communique (not yet on the CHP's website) urging Canadians to light a fire under politicians so they will adopt an idea that I advanced last week in the National Post. My Post op-ed called on Stephen Harper and provincial premiers to amend the law so that human rights commissions no longer have the power to censor journalists such as Ezra Levant, Mark Steyn and, for that matter, me. Vancouver journalist Terry O’Neill, former editor of the Western Report magazine, had an Op-Ed in the National Post calling for ‘human rights’ legislation to be drastically altered, to prevent those tribunals from behaving like ‘Star Chamber’ inquisitions, trampling on Canadians’ rights of free speech, freedom of opinion and expression, freedom of religion (and, I would add, our Charter-protected democratic political rights). We urgently need masses of Canadians to endorse Mr. O’Neill’s call for protection of our rights. NOW! How? Write or phone your MP! "Power concedes nothing without a demand. It never did and it never will. Find out just what people will submit to, and you have found out the exact amount of injustice and wrong which will be imposed upon them. The limits of tyrants are prescribed by the endurance of those whom they oppress." But wait. Aren’t words like "tyrants" and "oppression" a bit too strong? As Jonah Goldberg points out in his new book Liberal Fascism, it has long been understood that when fascism comes to the democracies of the West, it will come as a smiley-faced, "nice" fascism, full of good intentions. But fascism is still fascism. The heart of fascism is elevation of the State and its agencies to the status of little gods. The inevitable tool of fascists is using the power of the state to suppress ideas they cannot defeat with logic. That’s exactly what "human rights" tribunals are doing in Canada—right now, today—to journalists, publishers and politicians. And if we submit, as Douglass wrote—if we will not vigorously oppose the tyranny—we will deserve our chains. And there’s another important issue, beyond the freedom of speech and the freedom of the press that are now under threat: defending democracy and our Constitution from the hubris of judicial activism. Our courts have usurped Parliament’s exclusive authority of to write laws—and Parliament takes it lying down, without a murmur. "The problem," said Senator Anne Cools at a 1998 conference in Ottawa, "is not just judicial activism. It is also cowardice in the House of Commons." The Senator is right. We’ve been electing people to Parliament who lack either the vision or the courage to defend Parliament’s law-making authority and the restraint on tyranny we get from the division of government powers. Of all the 16 registered federal political parties, only the CHP—the sixth-largest party, and the one the mainstream media never tell the public about—has a plan to defend democracy and the Constitution. So who will bell the cat? Who will make the HRCs and judges keep to their proper spheres? It must be the people; and to do it, we must start electing MPs who are willing to endure the media’s scorn to defend the freedoms for which earlier generations were willing to risk their very lives. Jim Geraghty of National Review offers a scenario for the Democratic nomination that could split the party in half. If both Hillary and Obama are short of the majority necessary, there will be 156 delegates from Michigan and 210 delegates from Florida, most of which will be for Hillary, sitting on the sidelines (DJ's note: the Dem Nat'l Committee stripped them of their delegates because they moved their primaries up so early). The Clintons will fight tooth and nail to get those into the count. Under that scenario, the Obama camp and their supporters will be able to legitimately charge that yes, they did have the nomination stolen from them. the GOP convention will begin four days after the Democratic one ends. So odds are any attempt at “healing” will still be in the early (and unproductive) stages when the GOP nominee (whoever it is) can shake things up even further by picking an African-American running mate (say, former Maryland Lt. Governor Michael Steele or former Congressman J.C. Watts).
. . . titanic “ifs,” but should they all hold up, we could be headed for a realignment election of earth-shattering proportions. If a Canadian spring election is added to all this, we political junkies may need some serious rehab after this year. His punishment? A $15,000 fine and a 45 day suspension. However, on January 16th, the Saskatchewan Court of Appeals overturned the convictions, arguing that disciplining Whatcott was not "rationally related" to SALPN's legitimate objective of upholding public respect for the nursing profession. All in all, a good decision. Why should Mr. Whatcott's professional body be able to punish him for expressing his opinion in a legal manner while he was not even on the clock? Whatcott carried signs with pictures of fetuses, captioned “Planned Parenthood Aborts Babies.” He shouted phrases such as: “Planned Parenthood will give you AIDS”; “This place is the world’s biggest baby killer”; “Don’t let Planned Parenthood corrupt you;” “Planned Parenthood murders innocent babies”; and “fornicators will not inherit the kingdom”. SALPN's definition of "professional misconduct" includes lying and making defamatory statements, because these are activities that might bring their profession into disrepute. Whatcott's "Planned Parenthood = AIDS" comment is arguably false and defamatory. Shouldn't professional bodies be able to punish their members for telling outrageous lies? I met Joseph Quesnel at last year's Liberty Summer Seminar. He was thoughtful, erudite, and a nice guy all-around. So it comes as no surprise that he would be the author of this magnificent essay on social conservatism and libertarianism in the C2C Journal of Conservative Ideas. "Thus, it would be illogical for a social conservative to declare that they want to impose their beliefs and morality on society. That would be a violation of the right of religious conscience. Within the New Testament, Christ spoke often of the Kingdom of God in the future tense and as distinct from the earthly realm. His will was that individuals come to repentance and change their individual lives. There was never any mention of imposing the Kingdom of Heaven on earth or forcing people to accept beliefs they disagreed with. After all, most of the sins and sanctions mentioned within the Bible are applicable only to Christians who voluntarily accept them. This is one area social conservatives need to work on. Without compromising their beliefs, their judgments could be better spent in making existing believers more committed than in judging those who do not come under their moral code. This would entail social conservatives disentangling their morality from the justice system, which may prove a problem with some. "This social conservative belief in individual conscience is what allows it to enter into conversation with libertarianism. If religious conviction is ultimately private, there is room for other conceptions of the moral good life in society. It would be immoral to impose a religious vision on another. It stands to reason within most religions or moral codes that they are more meaningful if they are arrived at through genuine faith coming from the individual. "Therefore, there is absolutely no contradiction between holding social conservative beliefs and being libertarian as a matter of policy. As long as social conservatives do not try to legislate their values or impose them on others, they are following the libertarian commitment of respect for individual rights." Bravo! There is more to be said about this, and Joseph spends a lot of his essay saying much, much more. Do head on over, and read the piece in its entirety. It is worth the time it takes to read it. I should note that I'm always surprised by how much content some want to stuff into "libertarianism." At bottom, libertarianism is a commitment about what government institutions should look like, the concept alone does not tell us exactly why government institutions should look like that. As Joe makes plain, you can be a thorough-going social conservative, and still have a commitment to liberty and small government; a commitment to generating social conservative outcomes through persuasion, rather than at the point of a gun. The National Post's Jonathan Kay is appalled that Canada has no law regulating or outlawing second- and third-trimester abortions, and wonders how this has come to pass. He thinks he found his answer at a Toronto "symposium." He writes, "Locked in what they feel to be a tribal culture war against pro-lifers, the pro-choice camp allows itself no nuance. This is essentially the reason Canada has no abortion law: Any stirring of legislative action arouses such tribal war fury among pro-choicers as to send politicians scurrying." In other words, the pro-aborts are fanatics. 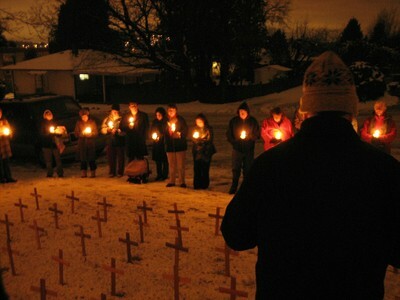 About 60 pro-lifers braved the sub-zero weather in suburban Coquitlam last night to attend a candlelight prayer vigil to mark the 20th anniversary of the Supreme Court of Canada's infamous Morgentaler decision (see my entry from yesterday, below, for more information). The event was peaceful, loving and, ultimately, hopeful. Here's a photo of the event. No, no, don't worry. I'm not about to out all of the conservatives who have gone ahead and smoked the reefer or snorted the cocaine or got a little high on prescription drugs. This isn't a post about hypocrisy. Instead, it's a post about all of the conservatives who have seen fit to urge an end to the war on drugs. The war on drugs is a disaster. And it is unjust. And this law is insane. And it is a waste of money. And it is a big government program. And it is a nanny state program. And it is all of those things, and more. Some time in the not-too-distant future, you will agree with me. The daily deluge of policy papers, academic scribblings, op-eds, medical journal findings, and public opinion polls which all point in a similar direction is bound to have an effect on you. If not today, then tomorrow. And if not tomorrow, then a week or month from now. And if you still think it a good idea to incarcerate pot smokers and growers 20 years from now, you will change your mind 20 years later. But the longer it takes for you to change your mind, the longer will this disaster of a policy continue. The longer will we have to put up with lives utterly ruined and destroyed by this policy. This post is aimed at small- and big-c conservatives. At those who are conservative philosophically, and those who support the political party. It is not really intended for anyone else, since the authorities I cite, and the instances I give are tailored to convince conservatives, not liberals, socialists, and so on. Thoughtful and intelligent conservatives agree that the war on drugs is a lost cause, and the source of a massive amount of injustice, crime, and loss of life (in both the literal, and figurative sense). PJ: Now you also said in that same article that this was an ethical issue as well. "The report shows that marijuana legalization -- replacing prohibition with a system of taxation and regulation -- would save $7.7 billion per year in state and federal expenditures on prohibition enforcement and produce tax revenues of at least $2.4 billion annually if marijuana were taxed like most consumer goods. If, however, marijuana were taxed similarly to alcohol or tobacco, it might generate as much as $6.2 billion annually. The fact that marijuana prohibition has these budgetary impacts does not by itself mean prohibition is bad policy. Existing evidence, however, suggests prohibition has minimal benefits and may itself cause substantial harm." "...it is our judgment that the war on drugs has failed, that it is diverting intelligent energy away from how to deal with the problem of addiction, that it is wasting our resources, and that it is encouraging civil, judicial, and penal procedures associated with police states. We all agree on movement toward legalization, even though we may differ on just how far." "I leave it at this, that it is outrageous to live in a society whose laws tolerate sending young people to life in prison because they grew, or distributed, a dozen ounces of marijuana. I would hope that the good offices of your vital profession would mobilize at least to protest such excesses of wartime zeal, the legal equivalent of a My Lai massacre. And perhaps proceed to recommend the legalization of the sale of most drugs, except to minors." The Economist doesn't flinch from the subject. The magazine most likely to be found on the shelves of intelligent conservatives and libertarians (amongst a host of others who are serious about economics) agrees: The War on Drugs is a bad idea. "John Stuart Mill was right. Over himself, over his own body and mind, the individual is sovereign. Trade in drugs may be immoral or irresponsible, but it should no longer be illegal." "Marijuana legalization has long been the subject of academic debate. The time has come to turn conjecture into law. Canada's police, judges and prosecutors have better things to do with their time than track down those who produce and consume a substance no more dangerous than alcohol and tobacco. We should begin the decriminalization of marijuana by immediately reducing the punishments that can be imposed for its possession to modest fines -- and start thinking about how to regulate its use." "Too often, our political culture equates legalizing drugs with being soft on criminals. But it is criminalization, not legalization, that guarantees wealth and power for gangs and pushers. We will argue Monday that it need not be this way." "The recent history of drug enforcement, both in Canada and the United States, is largely a record of failure. Tax dollars are lavished on enforcement. Police powers are expanded at the expense of civil liberties. Criminal gangs grow richer. And drug use goes on regardless." "But people constantly engage in any number of activities that, like drug use, physically endanger only themselves but risk inflicting emotional trauma on others should something go wrong: scuba diving, skiing, driving Highway 401. Others may be traumatized when sons marry outside the family religion, daughters form sexual relationships with other women, or parents divorce. With harm stretched beyond its original, liberal meaning, almost any activity that attracted a vociferous lobby group and applause-seeking politicians could be outlawed. If we are to have a free society in any meaningful sense, J.S. Mill's great liberal maxim must be re-invigorated, but with the original, narrow definition of harm intact. And Canada, secure in the knowledge of what is right in a free society, should allow its citizens to make their own decisions about whether or not to use drugs." "The history of drug use confirms that we will never live in a drug-free society: Too many people inevitably just say yes. But we can have a society in which the worst effects of drug addiction are minimized, and those who are addicted are helped. We can have a society where mafia and biker gangs are not made rich and powerful by the ban on drugs. Most importantly, we can have a society where the criminal law reflects not expediency and prejudice but principle. We can work toward a society clearly and consistently founded on the great liberal maxim of John Stuart Mill, that: "The individual is not accountable to society for his actions, insofar as these concern the interests of no person but himself."" Stephen Easton, writing a Fraser Institute policy paper, thinks the enemy (drugs) has won. That's right, the Fraser Institute, Canada's most important free market think tank, the place most likely to draw the smartest and best conservatives (and libertarians) in this country. In spite of the greatest anti-drug enforcement effort in U.S. history, the drug problem is worse than ever. What should be done now?... The status quo is intolerable--everyone agrees on that. But there are only two alternatives: further escalate the war on drugs, or legalize them. Once the public grasps the consequences of escalation, legalization may win out by default." Still think the war on drugs is a good idea? You swim against the tide of considered conservative opinion, my friend. Soon, you'll be swimming alone. A liberal dose of hysterical hyperbole from the left coast's left-wing online magazine. For the Republicans, I'm guessing Romney; for the Democrats, Clinton (yes, the Dems have a primary; there just aren't any delegates involved due to the penalties for having it so early - Clinton is the only candidate who campaigned, albeit stealthily, in the Sunshine State). Glenn Beck spent some time tonight remembering a great leader of the Mormon church and a champion of personal liberty. Layton: We can't win, and the lies supporting why we shouldn't try . . . When it comes to the Afghanistan mission, Jack Layton lets us all know what he's against. What's far less clear is what he's for. Then again, Jack plays it loose with the facts when describing even the Manley Report, which gets a lot more specific than a defeatist like Jack ever dares. . . In an interview with Don Newman on CBC Newsworld's Politics today, Jack said at one point that there was no mention of "Peace" by Manley. This isn't quite true. It's mentioned more than forty (40) times in the Manley Report, on pages 8, 12, 14, 20, 21, 24, 25. 34, 35, 36, 37, 39, 49, 57, 66. 71, 72, 73, 78, 79, 81, and 89. When Don pressed him to explain what good could possibly come from doing as the NDP wants and withdrawing the troops that are protecting the people of Afghanistan and the people working to rebuild that country, Jack sputtered out some dodgy nothingness about getting the UN involved . . . .
Get the U.N. involved? OK. Done. The mission in Afghanistan is sanctioned and by the United Nations. In fact, Jack, the UN wants to bring these Taliban SOBs to justice just like the rest of us - It just called for a redoubling of efforts ten days ago after a recent bombing. I guess Layton isn't above trying to capitalize on the 'information deficit.' He'd prefer to spread the lie that the UN isn't involved or that the UN's prescription would be some magic solution that didn't involve fighting the bad guys. Jack's not above a lot of stuff. He uses Afghanistan's Human Rights Commission as a source of information on civilian casualties, but is silent on the fact that the head of that same Human Rights Commission disagrees completely with Jack's pro-pullout Afghanistan policy. So the Human Rights Commission in Afghanistan that Jack considers reliable wants Canada's troops to stay in their current role. What's left for Jack to suggest? ". . . it's as though we're gonna charge off with a few more troops and win a war that clearly can't be won. " Whether or not he's intending to serve in the role, Jack Layton is a great asset to the anti-democratic, anti-women, anti-freedom and anti-peace cause of the Taliban. What's lost on him and his supporters is the fact that even if every NATO soldier packed it in today, there'd be nothing "peaceful" about the re-establishment of a country-sized thug ghetto and a torturous regime. Seems Bill Clinton is doing his wife Hillary more harm than good in her quest to become the Democratic nominee for president. Thwarting Hillary's political ambitions is probably a worse sin in her mind than marital infidelity. So Bill better watch out. On the other hand, Victor Davis Hanson wonders why Bill wants America to embrace Hillary when he spent 30 years running away from her. The show tapes and airs tomorrow (Tuesday, January 29, 2008). Details here. Controversy over "the right to offend" is on the boil in the Netherlands, as Western values clash with the usual villain. Interesting to see that Simon Fraser University's Women's Studies Department is being lauded in this poster about tonight's feminist celebration of the 20th anniversary of the Supreme Court of Canada's Morgentaler decision. More evidence of the rampant bias in such departments, it appears. Also interesting to see is that the part of the poster that advertises the screening of the documentary film Henry describes the abortionist as "one of Canada's biggest heroes." It's a ridiculous assertion, of course, especially in light of the fact that last summer's flawed but telling Beaver poll placed him as the third "worst Canadian" of all time--showing that he remains an extremely divisive figure. Meantime, while feminists gather tonight to celebrate their unfettered ability to kill defenceless unborn children, a pro-life group in my neck of the woods will be holding a candlelight prayer vigil to mark the infamous date. Organizer Colleen Roy says her group will erect 274 tiny crosses, one for each of the unborn children who dies every day at the hands of an abortionist in Canada. Approximately 24 hours after I decided the GOP candidates couldn't stumble backwards fast enough, a spat between two of them over Iraq has convinced me that one stopped his reversal cold. As I have traveled the road from Fairfax County political activist to Spotsylvania blogger, America has gone from a deceptive “peace” to a war for her survival against an array of enemies from the Middle East and Central Asia (Wahhabists, Ba’athists, and Khomeinists - hence my term for this war: the Wahhabist-Ba’athist-Khomeinist War, or WBK War for short). Now, of the five candidates, only four (McCain, Mitt Romney, Rudy Giuliani, and Mike Huckabee) and seem to recognize the danger we face; only three (McCain, Giuliani, and Huckabee) seem determined to fight the enemy wherever it can be found; only two (McCain and Giuliani) are adequately aware of the ways of the world to put that determination to good use. Only one has the experience, determination, foresight, and vision to win this war as soon as possible, and he is John McCain. Surprised? I know I am. What are our parliamentarians thinking? Gerry Nicholls reminds us that parliament convenes tomorrow. The best way I know to understand what’s on the minds of our parliamentarians is to take a look at the private members bills before the house. I like James Bezan’s initiative to create “Ukrainian Famine and Genocide Memorial Day.” An annual reminder of the horrors of Stalinism seems like a good idea. I’m always impressed with the legislative work of Gary Breitkreuz. He’s solid, and so is his bill to strengthen property rights. And here’s one for the Conservative base: Ken Epp’s crafty little bill to strengthen the legal rights of the unborn and force a debate on abortion. And here’s an awful private members bills from Liberal Wayne Easter to promote supply management in agriculture. Bad idea. I have my own standard for good legislation: 1. It's written with an eraser. 2. Government is reduced. 3) And the private sector and civil society is strengthened. I've learned to expect less. I can't wait to see what issues the Liberals raise in the House of Commons on behalf of the CBC. Cust is presently an intern at the Fraser Institute in Vancouver. He is a veteran of many political campaigns including Stockwell Day's campaign for leadership of the Canadian Alliance and Marc Emery's BC Marijuana Party provincial election in 2001. He is the author of essays including Block the Extradition of a Hero for Liberty, The Politics of South Park, and Canada’s Stake in the Security and Prosperity Partnership. RSVP required: Please let me know if you are coming by replying to this announcement ([email protected]). (Cheers wants to know how many will be there.) Please feel free to distribute this announcement to those you think will be interested in this fine talk. PS: A popular topic of dinner conversation will undoubtedly be whether the Ron Paul campaign will be helpful for libertarianism. Think you’re a defender of free speech? How far are you willing to go? Everyone seems to agree that defamation laws and libel chill can be a threat to free speech, but nobody seems prepared to call for an end to these laws. Most commentators have argued that one has a legitimate ownership right to one’s reputation. But this is not so. For the simple reason that one’s reputation consists of the thoughts of other people. That is, A’s reputation consists solely of the thoughts of B, C, D, and B’s reputation of those of A, C, D . . . etc. But since no one can own the thoughts of other people, one cannot, paradoxically, own one’s own reputation. While there can be no universal right to one’s reputation, and libel and defamation do not constitute exploitation per se, the right of a person to engage in libellous or defamatory action is not unrestricted. For while everyone has an unrestricted right concerning his thoughts, the right of free speech is not absolute. For example, no one has the right to tell another person ‘unless you hand over to me your wallet, I’ll shoot you.’ This sort of speech would be strictly forbidden in a private property society. It is a threat to engage in initiatory violence. As well, no one, including any of my detractors, has a right to come to my living room to give me a speech or tell me what he thinks about me and when I tell him to leave object on the ground of his right to freedom of speech. A trespasser has no free speech rights whatsoever – on my property. Free speech rights, so called, are really but an instance of private property rights. I can say anything I want on my property and so can anyone else, including any libellous person, on his own property. Walter Block, the co-author of this essay, dedicates a chapter to this subject in his book Defending the Undefendable. Frederick Hayek called the book “a real service”. If you don’t oppose defamation laws in principle, can you really condemn those who use these laws to protect their reputations from harm? While we're all waiting to see who will be the Democrat and Republican nominee, you can have your own primary and caucus battle with Kongregate's Campaign Game. The game is simple. Pick your candidate from the list provided. Select three staff members from a list of four: a hatchet man, a spin meister, a fundraiser, and an operative. Each one has their own special skills and talents. Then go on to try and win states to earn money for special attack moves (like an attack ad, a scathing attack, a flag wave, and so on), or just go ahead and attack the other campaign and their staff to eliminate them from the board. Canada's left coast is sliding further and further to the left these days, as the B.C. Liberal government of Gordon Campbell tries to elbow its way to the front of the climate-change stampede. Finance Minister Carole Taylor is even talking about introducing carbon taxes in the upcoming provincial budget, a measure she at first declared would be revenue neutral. However, she later contradicted herself by revealing that she wasn't actually planning any tax reductions to offset the increases. Mary Woo Sims and I debate this issue in today's Face to Face feature in the Tri-City News. Of course, given my scepticism about the whole climate-change juggernaut, I'm opposed to any carbon tax. But I also advance the position that government should not be forcing citizens to pay any such tax in the first place. Let those of us who think global-warming is a serious problem adopt voluntary measures to fight it; the rest of us can continue leading our lives in a way we consider to be reasonable and responsible. Also on the subject of sneaky, green tax increases, the Vancouver Sun's Vaughn Palmer on Saturday exposed the surreptitious way in which the Campbell crowd snuck in a new energy tax last year, also part of his global-warming-fighting agenda. Perhaps it's time to start taking the B.C. Conservative Party a little more seriously. There is one episode, however, that I found particularly interesting. It's called "Who can commit more crimes?" That's the premise, and the contest. Turns out a whole pile of nonsense counts as a crime nowadays, and the fact that you may have broken some laws without even knowing it is worth talking about. What follows is part 1 of 3 embedded. There are links for parts 2 and 3 if you decide you want to watch the whole episode. Barack Obama's huge win will have the punditry going ga-ga and insisting he has the momentum now. Don't believe it. In fact, I was more disturbed by the state of the race after I saw the debate than before. I drifted from candidate to candidate during the debate, only to have the candidates themselves remind me why I stayed away from them in the first place. I know it sounds weird, but the more we find out about these candidates, the worse they look. It could be a tremendous problem for the GOP come November. Warren Kinsella, National Post scribe, author, punk, and former Liberal spin meister, has been involved in the human rights commission discussion of late. Mostly, he is busy defending Richard Warman, the man who accounts for a whole pile of Human Rights Commission cases (mostly against neo-Nazis and white supremacists), as a modern-day saint and hero. I can't vouch for his assessment of Warman. The Citizen put together as close to a hagiography of the man as you can get recently, and I see no reason not to think of him as a courageous man who uses, what I consider, terrible means to accomplish laudable ends. We all want neo-Nazis and white supremacists to shut up. There is nothing to be said for the vile views of "white nationalists" or whatever neologism they come up with to defend their idiocy of judging whole groups of people by the colour of their skin, or their ethnic background, or the colour of their hair, or whether they're right- or left-handed (they're all just as stupid a basis for making normative judgments about character). Nevertheless, some of us want to protect freedom of speech and expression. That includes vile speech, and speech that we would never accept in polite company, or in our home (whether that's an inclusive or exclusive disjunction depends on your home), and so on. "I've written that I think Ezra Levant, who I like a lot, is full of crap on this "free speech" crusade he sort-of leads. Mark Steyn is full of crap, too, for similar reasons. "...The terrorism of September 11 was, and I very loosely quote Mr. Steyn, “a rude awakening from the indulgences of the last decade - disabled employees in wheelchairs, whom the Americans with Disabilities Act and the various lobby groups insist can do anything able-bodied people can, found themselves trapped on the 80th floor, unable to get downstairs…"
"From his perch in rural New Hampshire, Steyn popped a head valve when I objected to the fact that he was seemingly implying that people in wheelchairs shouldn't have been in the Twin Towers and, well, they sort of deserved what they got. He then withheld his column from the National Post for weeks, until two (not one, two) bizarre apologies were extracted from the Citizen's top truckler. Not very free-speechy of him, was it? What happened to the free exchange of ideas and all that, Marko? " Here is point one: True, Kinsella does say "free speechy," which might be a hedge. Nevertheless, it is no violation of anyones free speech for Steyn to insist on getting an apology before he releases his columns or articles. That's his, well, right. It doesn't violate free speech for him to insist on 18 kittens and a basket of fruit from Warren Kinsella himself before he sends out his columns. He can make any demands he wants. If the Ottawa Citizen decides to cave in, that's their prerogative as well. It's their paper. They own it. They get to control what goes in, and what stays out. Just because they've declined to publish an op-ed I sent them many moons ago does not mean that my freedom of speech was violated. It just means that they made an editorial decision to exclude my op-ed from their paper because it didn't meet their standards, or they didn't like my name, or they didn't like my use of commas, or whatever. "(They wanted me to apologize to Steyn, too, for disapproving of the fact that Steyn called Chinese people "chinks" and Japanese people "japs." Shortly after I told the Citizen's editor-in-chief I wouldn't apologize for telling the truth, my column was canned. Free speechers, unite! Defend Warren, now!)" Again, a mistake, and point two: They can can you, Warren. They can fire you if Steyn insists on it. That's all perfectly within their rights, and is no violation of freedom of speech or expression whatsoever. We can defend you if we think they made a bad decision, or if we think you are fantastic and bring a novel perspective on the issues (and, truth be told, I often do think this), but not on grounds of defending freedom of speech. Because freedom of speech has nothing at all to do with it. Freedom of speech and expression amounts to my right to use my resources, and the resources of consenting others, to publish (almost) whatever I damn well please, on the property of those who consent, or in some public places. It is not a violation of your freedom of speech if you stood up on a chair in my kitchen, started pontificating about the joys of state-run schools, and I insisted that you either keep quiet or leave. It's my house, and my kitchen, and you'll do what I say there. In your own kitchen, Warren, you are free to pontificate about anything you'd like, to whoever you decide to invite in order to listen. And just as you are at the mercy of me, who owns the kitchen where you stand on my chair, so, too, are you at the mercy of the owners of The Citizen, who own the paper where you write your column. If they insist that you apologize to Steyn before they let you back into their, uhm, kitchen, then you have two choices: Apologize to Steyn, or take your ball and play elsewhere. It would be a violation of freedom of speech if I called the government or, more to the point, the Human Rights Commission to shut you up (it would be fine if I called them to get you out of my house). Freedom of speech and expression are violated if you are told to shut up by the government or one of her organs when you are on your own private property, or on property owned by someone who lets you say what you'd like there, or are distributing materials you had purchased, and so on. Within the constraints of private property, you can say whatever you damn well please, and the government shouldn't be allowed to prosecute or persecute you for doing it. (Of course, all the typical caveats about libel, and threats of violence, and fraud, and yelling "fire" in a crowded theatre apply). Incidentally, while Kinsella doesn't get it, Kelly Toughill does. Big time. In spite of the fact that she disagrees with Ezra and Steyn and the WS on just about every issue, she understands just what is at stake in this debate. It's not about whether you agree or disagree with Ezra, and it's not even remotely about Islam, or defending western culture, or whatever. It's about the Western Standard's legal right to publish what, in our judgment--and not the government's, or Shirlene McGovern's, or the Human Rights Commission's, or Warren Kinsella's, judgment--is a newsworthy, relevant, and important bit of news. Cancel your subscription, organize a boycott, write a nasty letter-to-the-editor, those are your consistent-with-freedom-0f-speech-and-expression rights. Sic the HRC on us? Hell no. "More regime opponents were killed or thrown into prison under Rafsanjani and Khatami than under Ahmadinejad. And both "reformers" tried to export the Khomeinist revolution via agents and clients in many Muslim countries, especially in the Middle East." Iranian regime reformers and hardliners are no different. The current so-called reformers are those who seized the US embassy in 1979 and helped massacre the dissidents in the 1980s and killed foreign based ex-government officials such as Prime Minister Shapur Bakhtiar and other Kurdish leaders. No elements of this inhumane regime can be trusted and voting in their sham elections only prolong the regime's life. And the US Secretary of State Condi Rice is wrong to believe that promoting dialogue with this evil regime can bring peace to the region. McCullough, our cartoonist, takes on the U.S. Federal Reserve in this week's comic entitled "Voodoo Economics." Just got wind of this press release. The Green Party, including all the people running in the by-elections, has come out to ask Justice Minister Rob Nicholson to intervene in the Marc Emery case. We wrote (sympathetically) about the Emery case in "Seeding Sovereignty." Our cartoonist, J.J. McCullough, saw things differently. VANCOUVER – Dan Grice, the Green Party candidate in the Vancouver-Quadra by-election, is condemning Justice Minister Rob Nicholson’s refusal to intervene in the Marc Emery extradition case. Vancouver resident Marc Emery and two of his employees have been facing extradition to the United States for mailing cannabis seeds across the border, where draconian legislation could have forced them to spend life in prison. Mr. Emery is set to agree to serve a five year sentence on the condition that his employees, including one who has Crohn’s disease and uses medicinal marijuana for her condition, are not charged. Selling cannabis seeds is typically considered a summary offense in Canada and Mr. Emery has not been charged domestically. Mr. Grice added that the Green Party would heed the call of the Canadian Senate’s 2002 Special Committee on Drugs by legalizing the adult use of marijuana and taxing the substance at a rate similar to tobacco. Watch Family Guy’s hilarious Osama bin Laden outtakes and listen to the anti-FCC song. Show creator Seth MacFarlane pushes the limits of free speech and good taste in every episode. 'What follows is my question to the AHR&CC and their response. Do I feel any better about my right to free speech and expression as supposedly protected by the Canadian Charter of Rights and Freedoms? Quite simply, no. Based on the way this Commission is currently operating I see it as a can of worms. How do we deal with it? Two days ago I attended a presentation by Alan Borovoy, entitled "Whatever happened to free speech?" He was one of the persons instumental in getting human rights commissions established. He was dead against them dabbling in "Freedom of Speech and Expression" matters but offered only turning the bright light of public scorn on their proceedings. I say if you are faced with dealing with a can of worms you first arm yourself with an appropriate can opener. What in the act authorizing your existence or the mandate under which the Alberta Human Rights and Citizenship Commission operates allows you to act on and award punishments in cases that are not in any way illegal and are strictly matters of free speech or freedom of expression which is expressly protected under the Canadian Charter of Rights and Freedoms? Thank you for your Alberta Connects inquiry. The Alberta Human Rights and Citizenship Commission is an independent body of the Government of Alberta. In addition to providing public information and education programs that help to reduce racism and discrimination, the Commission accepts human rights complaints made under the Human Rights, Citizenship and Multiculturalism Act (HRCMA). The HRCMA protects Albertans from discrimination on grounds such as race, colour, gender, and religious belief, and in areas such as employment, services, tenancy, and publications and notices. The Act also includes a strong statement upholding the right to free expression of opinion on any subject. When the Commission receives a complaint in the area of publications and notices, it has the difficult task of balancing the right to be free from discrimination and the right to free expression. The Commission is guided by the Act, by Supreme Court decisions, and decisions from other courts regarding what constitutes discrimination in publications. The Commission follows standard procedures that are in keeping with the provisions of the Act for all complaint files. Both parties are offered complaint conciliation services that often result in a settlement agreement. If settlement is not possible, the Commission conducts an investigation to determine whether or not there is a reasonable basis to proceed with the complaint. If there is no reasonable basis to proceed, the complaint is dismissed. If there is a reasonable basis to proceed, the matter is referred to a human rights panel. Government reviews all legislation from time to time to ensure that it is meeting its intended purpose, and your comments will be kept in mind".